After his release, Kuntar (who never expressed remorse for the attack) became a high-level figure for the terror group Hezbollah, responsible for building up their terror infrastructure in the Golan Heights, and in fact was recently placed on the US State Department list of designated terrorists. It’s been widely reported that Kuntar was killed over the weekend in a presumed IDF airstrike around Damascus. 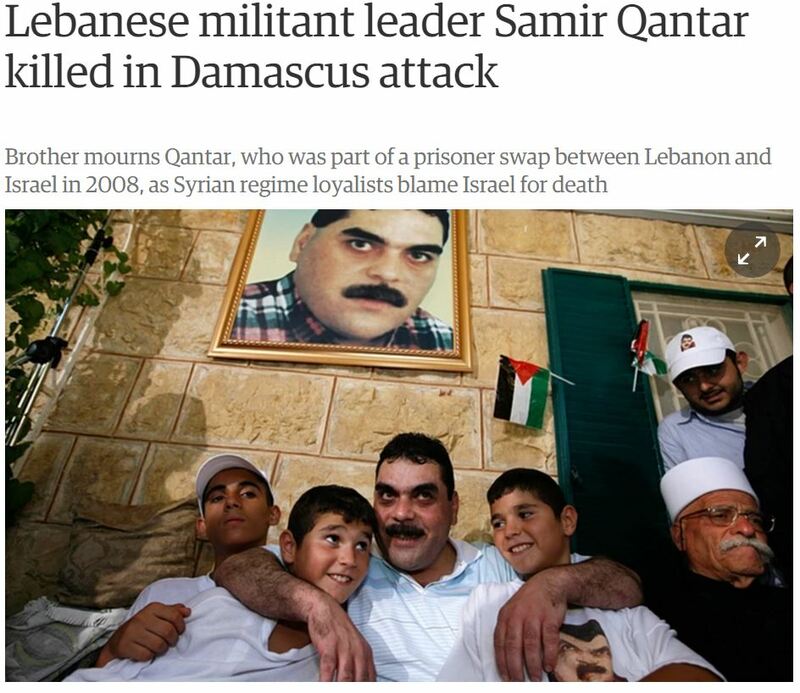 Here’s the photo Guardian editors chose to illustrate a story by Kate Shuttleworth on the death of Kuntar. Though the caption doesn’t note this, the photo of Kuntar with his arms around two children was taken shortly after his release in 2008. 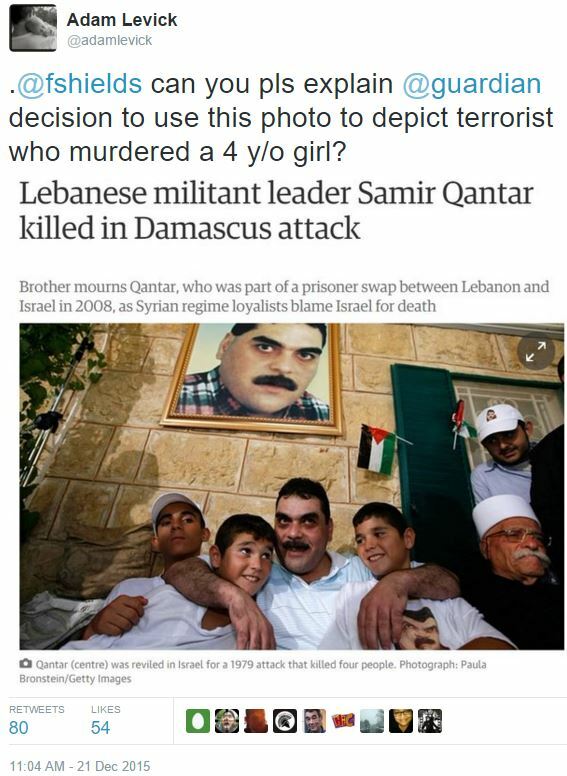 We should note that the Guardian article itself does note how the four-year old Einat was brutally murdered, thus making editors’ decision to illustrate the story with a photo of a ‘child-friendly’ Kuntar especially curious. We suggest emailing the Guardian’s readers’ editor to politely inquire about their decision to use this particular photo. UPDATE: The Guardian responded to UK Media Watch, informing us that they replaced the photo. The Guardian presents Quntar as the consummate family man, not the man who murdered a family. I am sure that most of its readers have been conditioned to the point where they are no longer shocked or aware of how disgusting that is. What do you expect from Socialist Der Guardian? Friendly suggestion: If you’re going to say “Or you can retweet this,” put a direct link to the tweet. You didn’t do that. You posted a .jpg image of the tweet. So you’d be forcing people to go to Twitter, type in the account name of that person, and scroll until they find that tweet, and then retweet it. A thousand times more effective, if you want people to retweet something, is obviously to post a direct link right to the tweet. Supporter of yours! Saying this as a friend. Even with this change, you should tweet at @fshields asking her to examine the motivation of the photo editor who picked the friendliest photo of a Jew-killing terrorist he/she could find. The top photo shows sami kuntar practicing for his 72 virgin boy future.